Primitive Worlds is a fossil company in Rochester, New York that appears to run a private quarry that harvest and sell Rochester Shale fossils. Their web site lists they have worked for over 20 years to find some extraordinary fossils. From that collection, they have created a picture book called The Silurian Experience and a subset of that book called the Field Guide. I obtained a field guide this month for $25 from their web site and it arrived promptly. The guide is not large being only 27 pages. What they did was take the pages from the 233 page main book and spiral bound them together. Pages from the main book are 1, 2, 16-20, 22, 26, 27, 39-41, 60, 63, 68, 72, 78, 86, 91, 96, 103, 110, 134, 146, 154, 158, and 162 comprise the field guide. As a result, the reader will see the thumbnail images of all the fossils contained in the book. The color pictures range in size approximately 2-7 cm in length and about 3-5 cm in height. 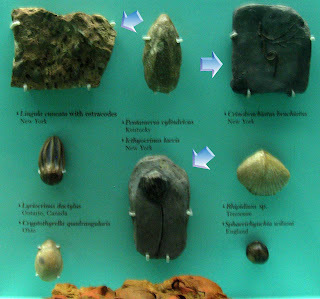 Brachiopods: Leptaena rhomboidalis, Atrypa reticularis, Trematospira camura, Homeospira cf. evax, Whitfieldella nitida, Dalejina hybrida, Coolinia suplana, Whitfieldella cf. oblata, Resserella elegantula, Howellella H. crispa, Rhynchonellid sp., Striispirifer niagarensis, Diabolirhynchus acinus, Dictyonella corallifera, Boucotinskia sulcata, Plectatrypa nodostriata, Lingula lamellata, Rhynchotreta R. americana, Stegerhynchus neglectum, and 12 undetermined specimens. Gastropods: Platyceras niagarensis, Naticonema niagarensis, and Niticonema sp. Worm tubes: Cornulites sp., Cornulites bellistriatus, and Cornulites arcuatus. Other Fossils: Prototaxites sp., Paracarcinosoma sp., Tentaculites niagarensis, Onchus deweii, Sphenothalus sp. Crinoids: Icthyocrinus laevis, Macrostylocrinus sp., Lyriocrinus dactylus, Stephanocrinus angulatus, Saccocrinus speciosus, Homocrinus parvus, Crinobrachiatus brachiatus, Dendrocrinus longidactylus, Lecanocrinus macropetalus, Gazacrinus sp., Eucalyptocrinites caelatus, Catatonocrinus sp. 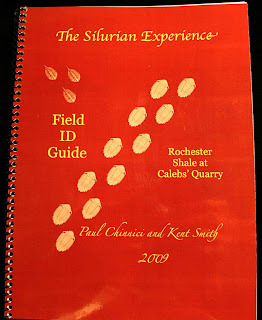 My reason for buying the book was help with identification of Waldron Shale fossils which I find mostly as fragments. The only guides I know of are old books (by paleontologists James Hall, Frank Springer, August Foerste, Henry Nettleroth, and Charles Beecher), websites like Indiana State Museum collections, eBay, Indiana9Fossils, and Week's Trilobites, and academic papers. The Primitive Worlds group (Ray Meyer, Kent Smith, Gene Thomas, Paul Chinnici, and Fred Barber) are the only ones I know of doing extensive collecting, prepping, and selling of Silurian Period fossils like these. The guide did not help me with brachiopod identification as I had hoped. They have quite a few unknown ones as well. I do not believe their identification of the Homeospira cf. evax is correct. 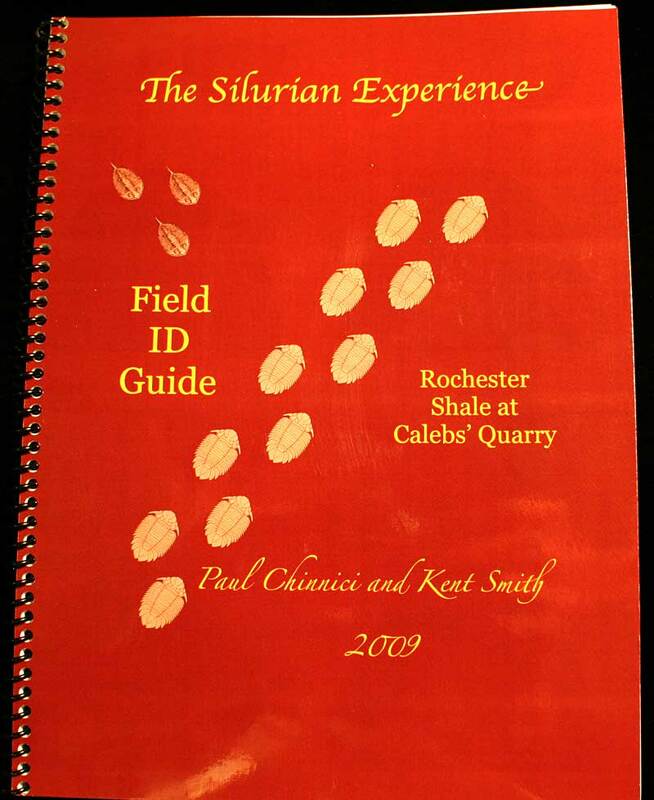 As for recommendations, the price of this guide is steep for the material it presents and the pictures too small to allow for good identifications of fossils like crinoids. 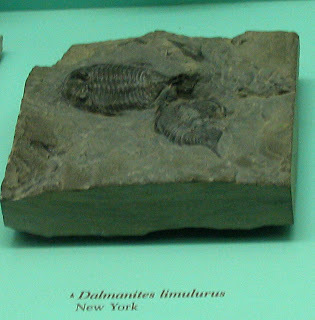 If you are looking for identifications or like pictures of very nice trilobites and crinoids and can afford the around $80 with shipping, buy the 233 page picture book. If you have a locality that has exposed Rochester, Osgood, Waldron, or Brownsport Shales then the guide would be a good starting point for you if you cannot pay the $80 for the book.